Orbit Bluetooth tracker helps you locate your keys, phone, or anything else you can attach it to. Using the free Orbit app, you can make your Orbit ring to locate it. If your Orbit is out of range (100ft) check the in-app map for Orbit's last known location. Have your Orbit but not your phone? Press the Orbit's button and your phone will ring, even on silent. 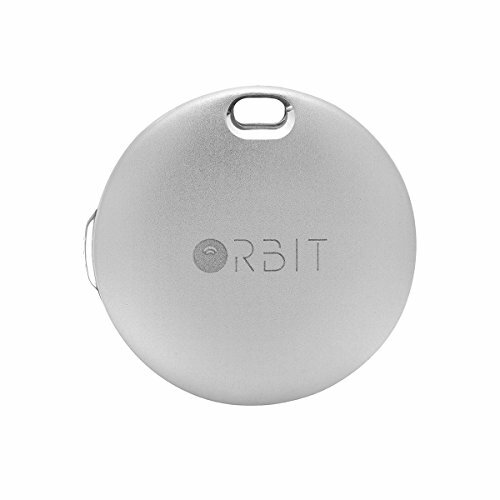 Use your Orbit tracker as a selfie remote; you can now take the perfect selfies or group shot. The Orbit app is free to download from the App Store or Google Play. Orbit works with iPhone 4s and later, or Android 4.4 and above. The Orbit is waterproof and comes with a replacement battery. FIND YOUR KEYS: Save yourself the stress of searching for misplaced items. Attach the Orbit Bluetooth tracker to your keys or place it inside your purse so you can find it in seconds just by using your Smartphone. If your Orbit is within range, it will play a loud tune until you locate it. FIND YOUR PHONE: Misplaced your phone? Simply press the button on your Orbit to make your phone ring even on silent! TAKE A SELFIE: Take the perfect selfie or group shot every time. Simply set up your phone, stand back and use the Orbit as a selfie remote. No need for a Selfie Stick. LAST KNOWN GPS LOCATION: Want to know the last time and place you had your keys? Give your memory a break and let the app tell you if you left them somewhere, so you know where to look first. REPLACEABLE BATTERY: No yearly subscriptions and no product wastage! No need to throw out your Orbit after the battery runs flat (battery life up of 6 months). The Orbit app will send you a notification that your battery is running low, and using the additional included battery, just twist and open to replace the battery.